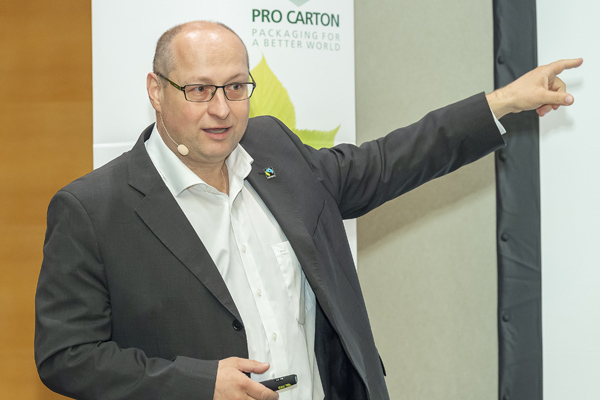 At the Pro Carton/PROPAK Austria Marketing Event in October 2018, Fairtrade Austria’s Managing Director Hartwig Kirner made it clear that the recycling economy of the future has already begun and that success is no longer conceivable without sustainable products. Fairtrade sold $8.49 billion worth of goods worldwide in 2017. In 2017 alone, sales increased by 8 per cent. The movement began in 1988 in the Netherlands. Today, Fairtrade International cooperates with 1.6 million farmers in 75 countries. Hartwig Kirner hails from the branded goods industry and over the past 11 years has made Fairtrade one of the most important brands in Austria. Fairtrade has set itself the goal of improving the situation of small farming families in Latin America, Africa and Asia. “It’s not about charity, but about fairly rewarding the people who make products for us. We have three pillars of sustainability in our retail portfolios: regionality, organic farming and fair trade”.